Before the iRhythm discussion began, Jon Norris of Silicon Valley Bank began the evening with an update on recent investment trends in the medical industry. Last year, medtech startups brought in $11.7B in funding, which wasn’t a record year, but still solid. Strong returns in biopharma have led to increasing investment in that sector, often at the expense of medtech. There is a trend of more activity, however, in Series A medical devices, which brought in 60 deals in 2016 equating to $257M. This year’s numbers show 16 Series A deals thus far with a total of $71M invested in devices. Total expected investments in medical devices this year is expected to be between $3.5B-3.9B. Cardiovascular is currently the top area for investors, including both sensor-based technologies and data collection. The average 510(k) device company is taking roughly 9 years to exit while PMA companies are taking about 5.5 years, contrary to popular belief that more difficult clinical and regulatory pathways increase time to exit. He concluded that the more innovative device technologies can compete with biopharma and that Series A deal volume and M&A are both currently stable. The story of iRhythm begins with Uday’s participation in the 2005-06 Biodesign Innovation Fellowship, which focused on cardiac electrophysiology (EP), or the study of cardiac arrhythmias. The need that led to the company’s formation was originally 11th on his team’s list of mixed needs but over time, rose to their top few during needs filtering. Given that Uday was a physician and had seen patients with cardiac arrhythmias frequently, it was clear that the team would be able to model and test assumptions quickly. Of course, there were people in the field they spoke to who assured them they wouldn’t be able to achieve what they set out to do. The team persisted and filed their provisional patent in February of 2006. Uday next had the tough decision of deciding whether to take a full-time clinical position or bring the need forward. Uday recalled a discussion he had with Dr. Yock, who said that it would be a varsity challenge, but if key risks could be mitigated, it would be worthwhile to try to take the need forward. The question of whether he had the skillset to run a company was one risk he needed to mitigate. He also knew that diagnostics were not the most appealing area for VCs at the time, but after winning the Boomer Venture Summit and having early discussions with VCs that showed no huge red flags, he decided to take the plunge into startup life. He was able to line up an initial funding round of $12.5M in January of 2007 after recruiting a few individuals with business experience in the space to join the team. Mark joined the team in mid-2007, bringing with him immense engineering expertise. 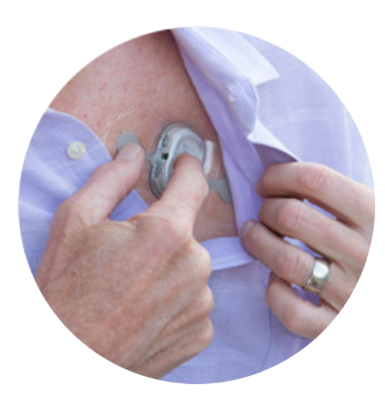 He had most recently been involved with the successful launch of Medtronic’s CareLink Network before coming to iRhythm, and also had family experience with heart problems which made him realize the problem they were setting out to solve made a lot of sense. The team realized that the service they would provide for patients and data they would collect were just as important, if not more important than the device itself. This vision that originated back then is still a major focus for iRhythm. In order to get the required amount of data, the team realized they needed to record cardiac rhythm data for 14 days whereas the existing market was limited to short-term collection devices such as Holter monitors, which meant they needed to build a whole new algorithm and processing infrastructure. With Mark’s forward thinking skills and a bit of luck, they were introduced to new technologies like Amazon Web Services (AWS) that could help to meet iRhythm’s needs. 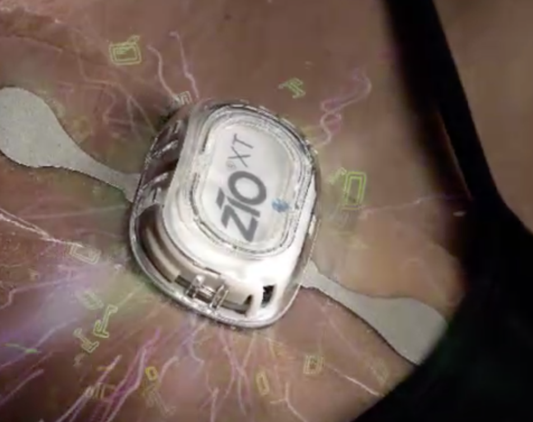 The initial funding they received gave the team the time and resources they needed to take what they had learned and integrate it into what would become the 2010 introduction of the Zio® Patch. They added to their team so that they were able to tackle R&D, manufacturing, distribution, clinical service, and delivery – briefly in one office before quickly diversifying to support growth. Kevin joined the team in 2012 as CEO of the then-70-person company. He knew they needed a fundable story that showed the convergence of data and patient experiences, so they used true clinical use cases to build their story. The team was also forced to overcome challenges with their algorithm and also to develop a more advanced, second-generation patch that would allow for improved adhesion in varied climates. By the time Derrick joined the team in 2015, the Company was 8 years old and had received $100M in funding, which had been used to de-risk the business significantly. They had invested time in gathering clinical evidence and had spent a significant amount of time and money to secure reimbursement coverage. Looking back, they concluded the risk of how the product would be paid for was probably the largest challenge they’ve overcome, specifically whether the payment is bundled or not. The lesson that they had learned was that the payers are the true gatekeepers, and what was most important for them was to be persistent and build relationships, which ultimately helped them convince the decision makers in the health plans. Currently, the company has over $230M invested, including $110M prior to the IPO. They’ve collected demographic data in their database for nearly 750 million patients. Although their patient group is deep, it’s also very targeted, which they hope will allow them to identify patients in the future who may be at-risk. The database has also helped to identify trends in the data and has been utilized for further development of the algorithm. They expect that it may be used more extensively in the future. iRhythm had public equity investors who wanted a clear path to growth, so they waited an extra year to go public and completed their IPO in October 2016. Derrick remarked that deciding how to position themselves took many discussions. Digital health was an exciting new area, but there weren’t very many success stories to date, so they opted to go with a traditional medtech positioning within a digital health framework. Kevin added that bankers had helped them value the company and create value, and that their contribution was outstanding, but also a physically grueling process. Post IPO, the team members tell themselves not to worry about the stock price, because it’s the people that make their company. Mark added that mistakes are inevitable, but if you find the right people who want to be there and want to solve the need, the company will grow, knowledge will grow, and value will grow. Uday also pointed out their strong culture of diversity that had been present from the start, to which Kevin added that the Company has over thirty-five countries represented among its employees and that women comprise 60% of the team. To create value, Uday recommends focusing on building a company, not just a product, knowing your business inside and out, being open to thinking creatively about the how to break down and solve pieces of the problem differently, and always paying attention to developing and maintaining the culture. Next steps for iRhythm include integrating further into electronic medical records, finding additional partners who can help bridge the gap of what to do with the data, and investigating the ability of deep learning algorithms to fully leverage the available data set, potentially to attack other medical conditions. Data collection can add significant value to a product and can help with gross market expansion, business reviews, and building sales.